The dehydration effects of both acute and chronic water loss in the body are significant. 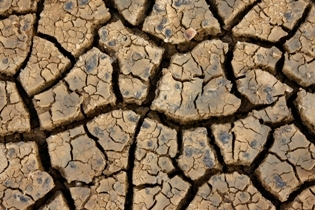 This image of water-deprived soil gives us a few clues as to what also happens over time to a chronically dehydrated body. Is this what you want your skin to look like? How about your organs? I have found that many people think of dehydration as something that only happens on a rare occasion, such as from a severe illness. Or perhaps they relate to a dehydrated runner in a marathon who hits the “wall” and collapses before the finish line. Others might think of a lone hiker they saw on the news who was stranded in the desert without food and water and suffered acute dehydration symptoms. However, chronic dehydration is actually widespread in America and throughout the world. And most people have no idea that they are experiencing dehydration effects that can lead to serious health issues. So what is dehydration? Webster’s dictionary definition is “an abnormal depletion of body fluids.” It occurs when the amount of fluids which leave the body are greater than that which is taken in. In addition, according to the Merck Manual, lost body fluids of all types contain electrolytes in varying concentrations. Thus, water loss is always accompanied by electrolyte loss. Both water and electrolytes are critical for proper hydration. Babies and small children are at higher risk for dehydration effects because of their smaller size and higher turnover of water and electrolytes. Thus, it is especially important for parents, grandparents and caretakers to know the signs and symptoms. Elderly adults and people with illnesses or chronic diseases are also more susceptible. Acute water loss is the type that occurs within a short period of time and is primarily due to vomiting and diarrhea associated with illness, overexertion through exercise, or other uncommon situations that cause fluid deprivation or fluid loss. Chronic dehydration is less noticeable and much more prevalent. It occurs when small amounts of water are not replaced in the body day after day. When the body loses water over time, a number of things happen. According to Dr. Batmanghelidj, acclaimed author of Your Body’s Many Cries for Water, the body redistributes and regulates the amount of available water. In other words, the available water is rationed and used where most needed. Water rationing allows the body to provide water for critical, life-sustaining functions. In the meantime, the less critical functions are put on hold. For example, high blood pressure, arthritis, asthma, allergies, digestive disorders and acid reflux are just a few of the conditions that are often an indication of water rationing in the body. Water rationing and long-term dehydration effects are significant. Likewise, the health benefits of drinking water and adequate hydration are often miraculous. Dehydration and Joint Pain - Is There a Connection?